In 1982, forest bathing became part of the national public health program in Japan. Forest bathing is a “Shinrin-yoku’’ therapy that encourages you to take in the forest atmosphere. This therapy has become a cornerstone of preventive health care and healing in Japanese medicine. Forest bathing doesn’t require you to do any exercise. No working out, no jogging or hiking, just quiet contemplation surrounded by trees. Forest bathing is about relaxing. Japan have spent many years studying the physical and psychological effects of forest bathing. From 2004 to 2012, they spent $4 million dollars conducting scientific research into the benefits of forest bathing. According to the findings, this Japanese practice has been proven to lower heart rate, boost immune system, reduce stress hormone production and improve your overall wellbeing. Essential oils, otherwise known as phytoncide, are found in wood, plants and some fruit and vegetables. Trees emit phytoncide to protect them from germs and insects. Qing Li, a professor at Nippon Medical School in Tokyo measured the activity of human natural killer (NK) cells in the immune system before and after exposure to the forest. The findings indicate that phytoncide exposure and decrease stress hormone levels may partially contribute to increased NK activity. Li’s subjects showed significant increase in NK cell activity in the week after a visit to the forest. Inhaling phytoncide seems to improve cell function and this is good for our health. Another study on the psychological effects of forest bathing surveyed 498 healthy volunteers twice in the forest and twice in control environments. After exposure to trees, the participants showed significantly reduce hostility and depression scores. They also exhibited increased liveliness. 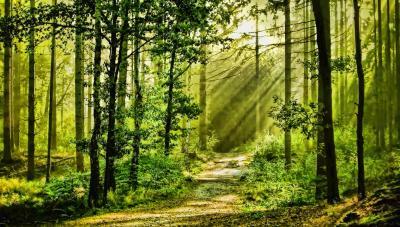 The authors concluded that: “forest environments can be viewed as therapeutic landscapes”. If you’re a city-dweller, a simple visit to the park can help relieve your stress. Some city-dwellers have even joined forest bathing clubs. By getting regular doses of nature, we can improve our immune system, as well as our well-being. In essence, nature can be a powerful healer. I think I am doing it. It definately reduces stress. I can tell I don't need a test to show it. I don't believe its entirely due to plant essential oils. I use essential oils occasionally and it does not explain the entire effect. It's simply a calming environment. I get about the same effect from visiting the beach. If you do it leave any smartphones or devices at home to increase the effect. I agree with you Works. I dream of moving to Santa Cruz or near the red woods. I dream of forests. Even deserts are soothing to me. Cities don't offer that and make me clostrauphobic these days. I also remember walking in the magical forest of Broceliande in the norhter western parts of France where King Arthur is supposed to have raise Excalibur from a rock and Merlin's tomb lies. It was so magical. The best part about forest is that besides the physiological qualities of their healthy and nurturing environment is the even-more subtle energies there. I miss that a lot and know I have to get closer to it again.